A German TV presenter has claimed he doctored footage showing the Greek Finance Minister Yanis Varoufakis, giving the middle-finger to Germany. It comes after a scandal, in which the Greek politician denied the video is authentic. The footage was shown on Sunday, at a weekly talk show on the German ARD channel, hosted by Günther Jauch. The Greek minister, who was a guest on the show, denied the actions depicted in it. Jan Böhmermann, host of the satirical programme Neo Magazin Royale on public broadcaster ZDF, confessed in a video posted on YouTube on Wednesday. "Dear Günther Jauch, dear ARD, dear editors of ‘Bild’, you must now all be very strong," Böhmermann can’t help laughing at his own words, as he starts to reveal what he did. “Sorry, Mr Varoufakis, we won’t do it again,” Böhmermann added, providing the details on how the video had been faked. The team first shot the gesture separately in the studio, and then added the hand using computer graphics, he claimed. Shadows were added to make it more real. Böhmermann explained their move, too. “Dear editorial staff of Günther Jauch, Yanis Varoufakis is wrong, you didn’t falsify the footage. You simply took it out of context, and gave it the runaround, so that the average Germans could pursue their passion of being angered,” he said in a video statement. “That’s what you did. And the rest is our effort,” Böhmermann added, smiling. On Monday, the show, which has millions of viewers, stated that it had seen “no indication whatsoever of manipulation or falsification in the video shown during the live show,” the Guardian reports. The video showed Varoufakis in 2013, before his appointment as finance minister, speaking at a lecture in the Croatian capital of Zagreb. In particular, Varoufakis said that Greece should have defaulted five years ago rather than accept a multi-billion euro loan. During the speech, Varoufakis says “stick the finger to Germany,” and seems to be gesturing rudely. Mr Varoufakis praised the satirical host for mocking the scandal, after the comedian published the footage revealing how the ‘middle-finger’ video had been doctored by his team. “Humor, satire, and self-deprecation are great solvents of blind nationalism. 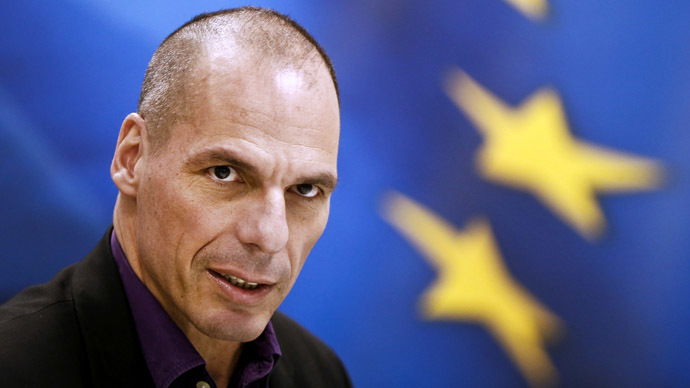 We politicians need you badly,” Varoufakis wrote on Twitter.